It’s almost impossible to describe Cloud Atlas, the extraordinary film of David Mitchell’s amazing novel of the same name. Six stories are told, all relating to one another, presenting critical junctures in the lives of several people living in various times. 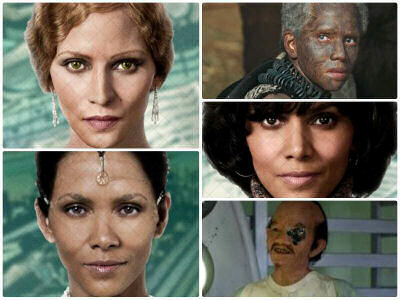 Tom Hanks and Halle Berry each play six roles, one in each story, and demonstrate a tremendous virtuosity of acting skills, each disappearing so completely in their six roles that at times you simply cannot recognize them. 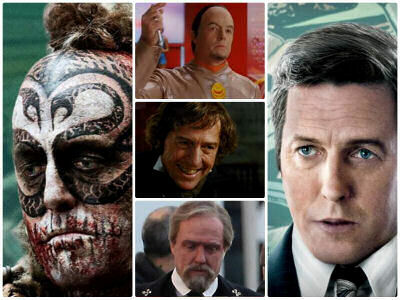 The supporting cast is equally brilliant: Jim Sturgess, Hugo Weaving, and Hugh Grant also play six roles equally well and a handful of other cast members play as many as five roles, each so unique that it is difficult to say who is whom in any given story. The novel mixes the stories only to a certain extent, in that each chapter focuses on a different story, but the book jumps from story to story as the next chapter presents itself. The movie takes this concept of mixing the six stories to a whole new level, often jumping from story to story in the pan of the camera or the tick of a sound, sometimes taking many minutes with one story and sometimes taking only seconds before jumping to the next story, back and forth, round and round until you feel like you’re sitting on the top of the front end of train moving at a hundred miles an hour. This is some of the finest film editing you will ever see, I guarantee. The stories themselves are in many ways related, either thematically, through character similarities or in philosophy. The first story chronologically takes place in the South Sea Islands and on the Pacific Ocean in 1849, as a young lawyer saves the life of a Moriori slave, who returns the favor. It relates to the final tale in that Morioris appear in both. The second story occurs in Europe in 1936 and details the life of a young composer apprenticed to a Master. The third story takes place in San Francisco in 1973 and tells the story of an investigative reporter in over her head with a corporate scam involving nuclear power. The fourth story is somewhat “present day” in that it happens in 2012 (the year the film was released) and tells the story of a publisher whose brother involuntarily commits him to hospital for seniors, under lock and key. The fifth story moves us firmly into science fiction. It takes place in “Neo-Seoul,” the gigantic metropolis that has replaced Old Seoul, which is mostly under water. Beautifully executed and full of action, this story tells the story of a genetically engineered “fabricant” who is liberated from her service job to help the revolution against a corrupt dystopian government. The final story takes place after the fall of civilization, “106 winters after the fall” and features Tom Hanks’ most brilliant performance of the film, as a Moriori triblesman who must deal with an alien Prescient (Berry) who is trying to get her people off planet because of the radiation. Most of you know that I rarely tolerate any movie that runs toward two hours, but in the two hours and forty two minutes of this film, I was never once bored. In fact, I felt completely in suspense the entire length of the film. It is so beautifully done! For another thing, I think it would leave you breathless and exhausted, almost hallucinatory. I watched it in two sittings. An hour and a half the first night and an hour and fifteen minutes the second. I’m certainly going to watch it again, perhaps many, many times. There will always be something new to get from it. If you just want to sit back and let a movie entertain you, with no thought or involvement on your part, you probably shouldn’t see it. But for those who quest for greater challenges and thought provoking action, this has to be considered a great, great film and certainly one that must be seen many times. A great film! Thanks for commenting.